IBF featherweight champion Lee Selby wants to establish himself on the world stage after signing a new partnership with Floyd Mayweather's advisor. The Welshman has signed a three-year deal to work with American Al Haymon. 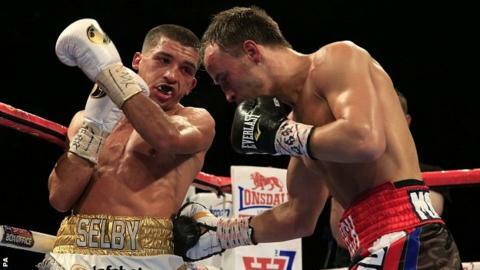 Selby, 28, defeated Evgeny Gradovich in May to win the IBF title and says the deal is a "massive opportunity". "I think I've cracked the British scene and now I'm world champion I'd like to showcase my talents across the world," he said. "Being with Al Haymon gives me the opportunity to do that and puts me on a different level." As well as looking after undefeated Mayweather, Haymon also manages more than 100 boxers, including British boxers Amir Khan,Carl Frampton and James DeGale. The controversial American, widely regarded as one of the most influential figures in boxing, will work as an advisor to Selby, who will continue to be managed by Chris Sanigar. Selby had planned to make his first IBF featherweight title defence in Cardiff but the Welshman says it is likely to be staged in the United States as part of the deal with Haymon. "I would have liked to have come back to Cardiff to defend my title for the first time," Selby told BBC Radio Wales Sport. "My loyal fans have been travelling around the country supporting me so I would have liked to have given something back. "Now this has come up I can't turn this type of opportunity down so I'll be fighting out in America. "I should be coming back to the UK early next year."